For me, the hotel where I stay is a big part of the travel experience. For this reason, I’m always on the lookout for quaint and unique hotels. I’m no snob: I’ve slept in tents, mud huts, and a few 1-star hotels. However, when it is possible, I like a hotel that provides a feel of the local culture, or, at least, a hotel that is an experience in itself. I found my favorite hotel to date quite by accident. I used Booking.com which I had never used before, and rarely since. The hotel is called Tambo del Inka. It is located in Urubamba in the Sacred Valley in Peru and it is one of the most beautiful places I have ever stayed. The Andes mountains provide an incredible backdrop to the exquisite architecture of the hotel. 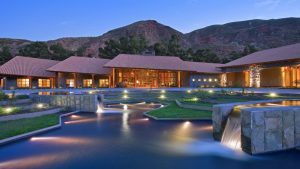 Tambo del Inka is a 5-star hotel. They were running a very good deal on Booking.com at the time, and we only spent about $200 per night. When we arrived at the hotel, we were greeted by name, and our luggage was taken care of for us. The rooms were incredibly luxurious. They had balconies that opened up to views of the Andes. Each room had a doorbell, but the staff would not ring the bell if the “Do Not Disturb” light was on. At the time, hubby and I were trying to book travel to Machu Picchu. We were delighted to learn that the hotel had a private train station where we could catch the train to Machu Picchu. We paid the hotel and they made all the necessary arrangements, including providing a guide to show us around Machu Picchu. After Machu Picchu, we spent the rest of our time at the hotel, simply enjoying the amenities. It was all perfect: from the infinity pool to the delicious food to the beautiful grounds to the doting staff. We were well-relaxed by the time our stay was over, and we left unwillingly. So, if you ever find yourself in Urubamba, treat yourself to a day or two at Tambo del Inka.